On the heels of the cancellation of its trip to Nigeria in August, the club has announced that four first team stars will be flying to Nigeria to take part in marketing activities with regional partners, Airtel and Malta Guinness. Sagna, Mertesacker, Podolski and Rosicky have been chosen to fly to Lagos with club officials in two weeks to take part in club events and activities organised by Airtel and Malta Guinness. The players will take part in a busy schedule of events in Lagos. Emmanuel Agu, marketing manager for (Malta) Guinness Nigeria plc commented: "Malta Guinness is the Official Malt Drink of Arsenal in Nigeria and we are looking forward to welcoming the Arsenal players to Lagos. "We are sure that they will have a most enjoyable visit as they experience the energy and vitality of their Nigerian fans. Over the next few days, we will be announcing how fans of the nation's No 1 malt drink - Malta Guinness - can enjoy not only the goodness of our new lower sugar variant, but also win the opportunity to interact and get involved with their idols at a number of exclusive events during their stay. 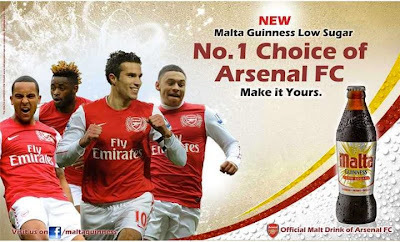 You can get more information by going to www.facebook.com/maltaguinness." The players will also be making appearances for mobile network operator Airtel. Deepak Srivastava, chief operating officer and executive director for Airtel Nigeria, said: "Arsenal has a very large supporter base in Nigeria and Airtel is eager to connect these fans with some of their favourite football players. "Indeed, Airtel is extremely committed to creating opportunities to excite and engage telecommunications consumers just as we are passionate about realising our brand vision of being the most-loved brand in the daily lives of Nigerians."